“As we continue the road uphill we shall see the Puggie, Puckie, or Pixy Stone, in a field on the. right-hand side ; a big granite rock, mossy and overgrown ; on the top is a rock basin, but there is no possibility of getting up to it without a ladder.” – Cresswell, p.47. 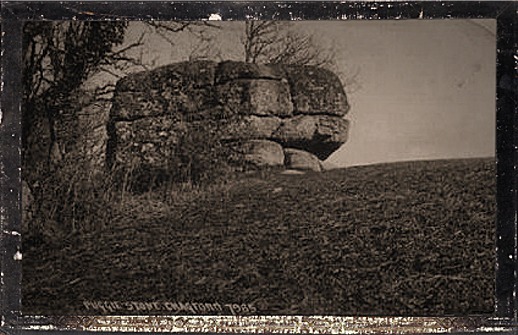 “Scarcely half a mile above Holy Street, a tor rises near the river’s bank on the south side, called by the country people the Puckle, or Puggie Stone, and celebrated for the large rock-basin, or pan (as it’s popularly called) on its summit. The antiquary, trusting to local report, will be disappointed when, after having succeeded in scaling the rock, he finds that the characteristics of the genuine rock basin, as herein before described, are not sufficiently clear to enable him to pronounce that this is not one of the examples attributable exclusively to the operation of natural agencies. Although of large size, it is not of the usual circular form, nor do its sides display and decisive indication of artificial adaptation...” Rowe, p.98. Even he is not over-enamoured with the rock but possibly where his disappointment came from was the fact that the rock basin on its summit was a natural feature as opposed to one fashioned by Druidical worshippers. At the time Rowe was writing there was a great belief amongst the antiquarians of the time that many of the naturally formed rock features and prehistoric monuments were all connected to the Druids. J. LL. W. Page, clearly following in Rowe’s footsteps must have felt compelled to say something about the rock in his book. After agreeing that a ladder was need to scale the rock he did add a few dimensions; “This isolated stone is certainly the largest single mass off the Moor… It has a length of twenty five feet, a breadth of eleven, and is no less than fourteen feet in height,” p.191. But at least the Ordnaance Survey surveyors of 1906 paid the rock a modicum of respect as can be seen below they actually marked it on their six-inch map of the time. Sadly their modern-day predecessors have failed to follow suit as it no longer appears on their maps. Clearly as most authors suggest there is a connection with the Piskies in the name of the rock so in theory there must be a folk tale of come time associated with it? Once again William Crossing misses an opportunity to shed some light on the matter. One would have thought that he would have included some tale in his famous book – Tales of the Dartmoor Pixies – but no, nothing. Similarly the same goes for his ‘Folklore and Legends of Dartmoor’ book – not a single sentence. Coming slightly more up to date just maybe Ruth St. Ledger Gordon in her book – ‘The Witchcraft and Folklore of Devon’ has more to say on the subject but alas no! So to sum things up on the piskie front I have failed dismally to find any reference to a folk tale regarding the rock and the ‘little folk’ what so ever! However, in an old book of 1905 there are a couple of references which could well change what initially appears to be a piskie related stone into something completely different. Firstly there is an old Devonshire term for the gable end of a house which is ‘pugging’. Could it be that the word ‘pugging’ has got corrupted into ‘puggie’ and that the stone resembles a house’s gable end? Or, even more strange is that on the same page the word ‘puggie’ is defined as meaning ‘a monkey‘. In which case heaven knows where that one leads? Wright, p.640. Alternatively in the same book the Devonshire word ‘puxy’ is listed and is pronounced in the Devonshire vernacular as pucksie and means a boggy place where a spring rises, p.661. Now there might be something in this because about 70 metres to the south-south east of the Puggie stone is a largish pool called the ‘Blacksmith’s Pool’. Could it be that at one time a spring arose from near the stone and and a ‘pucksie‘ area was formed? So, sadly the question remains as to how the rock got its name and what tale remains hidden in the shrouds of time, was it associated with piskies, monkeys, or a boggy area? Please note the Puggie Stone is on private land and therefore there is no entry to see it!! Cresswell, B. 1921. Dartmoor and its Surroundings. London: The Homeland Association Ltd. Crossing, W. 1990. Crossing’s Guide to Dartmoor. Newton Abbott: Peninsula Press. J. Wright (ed.) 1905. The English Dialect Dictionary. London: Henry Frowde.